Situated in the centre of Hawes which, in turn, is in the centre of the upper Wensleydale area of the Yorkshire Dales. It is therefore very convenient as a base for touring the rest of the Dales and also the Lake District. The hotel now, as of 2008, has 11 letting rooms which are all en suite. 2 of the rooms have 4-poster beds and the 3 new rooms which we are describing as Superior Rooms, have king size beds, two with full bathrooms with bath and shower and one with walk-in shower, stunning panoramic views, dressing gowns and flat screen TV with DVD. 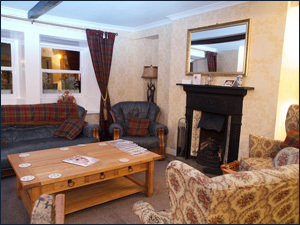 Additional pictures of the Hotel and around Hawes are to be found on the location page, also are photographs of the interiors in the rooms page. The lounge, shown to the left, created by bringing in to use an area previously not part of the operating hotel; so we now have more space to offer our guests, whether you are enjoying a coffee in the afternoon or a pre-dinner drink, it all adds up to a better experience. The restaurant, which seats up to 24 people, is open to both residents and non-residents and has the benefit of a table and residential licence. There is an extensive wine list with a large price range. The chef has been at Cocketts for over 20 years and has built up an excellent reputation during that time. The large a la carté menu offers something for everyone. Teas and coffees are also served during the day. The proprietors are very flexible and will try to accommodate any special occasions or guests requirements.